Size/shape: 15.5mm dagger-shaped beads with the hole running sideways through the narrowest end. 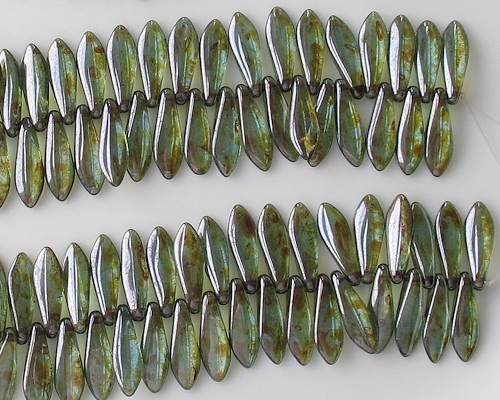 Colors/description: Light forest green beads with a mottled brown luster coating. I believe that the green color is in the coating also, but I'm not sure. 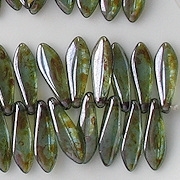 It appears that the beads were coated twice, first with green, and then with mottled brown luster. Another possibility is that the green color is part of the luster coating. Defects: The picture revealed that a small number of beads are malformed. 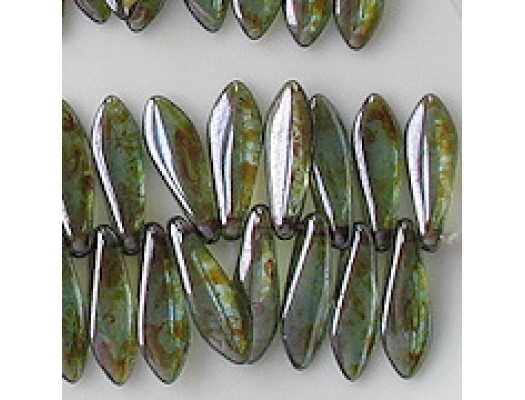 Comments: The luster coating is really intense on these beads. I really like them. The price of daggers is always higher than I think it should be. I see a bead with very little glass in it and think it should be cheap, but the supplier sees a bead with a long dimension (16mm) and puts a high price on it.